Follow signs to Hastings and St Leonards. Pass through Silverhill junction (taking left hand lane). Then take right hand lane towards St. Leonards' Centre (London Road). Tower Road West (where Tower House 1066 is situated) will be found approximately � mile on the right. After Hastings Pier, pass Warrior Square Gardens traffic lights, take the London Road (on the right). Tower Road West will be found approximately � mile on the left. Turn left at Filsham Road traffic lights (signed A21 to London). At the top, turn left, then sharp right into Charles Road West. At the crossroads turn left into Tower Road West for Tower House 1066. Our nearest station is St Leonards Warrior Square (Tower House 1066 is � mile north of the station). You can get a train from London Charing Cross, London Victoria, Gatwick, Brighton and Eastbourne. 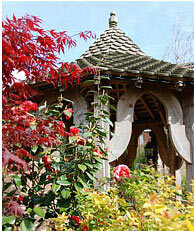 London is just over an hour away by car (via the A21). The Channel Tunnel and the ferry ports of Dover and Newhaven are within an hour's drive. Tower House 1066 also makes a great base for exploring other towns in the area such as Brighton (1 hour), Rye (20mins), Lewes (50mins), Tunbridge Wells (30mins) or Eastbourne (30mins). We have free unrestricted on-street parking. 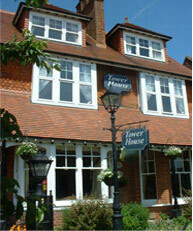 Do contact us if you have any queries about getting to Tower House 1066 (our B&B in East Sussex). 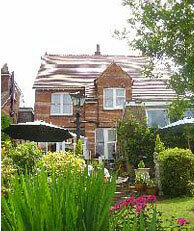 Or find out more about staying with us for business or pleasure.